Oh well........all legends retire at some point. How do these X5550's pump out so many WU's? Even rock star boincers like Mumps & Ste\/e will soon will be dethroned by gridcoin. Besides gridcoin's team account they also have pools, like the first one chooka has linked to. 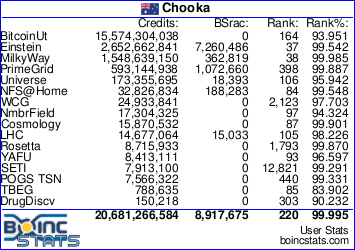 Chooka's first link is that of "grcpool.com" which is not one user but many users that are a part of that pool. There are others too such as "pool.gridcoin.co" and 5 or 6 others by what I can tell and most of them are flying up the ranks too. While it's impossible to tell exactly how many people are crunching there at any one moment but by the hundreds of PC's listed in each of those pools there must be a lot. So there could be from dozens or hundreds of cruncher that are crunching under the one username at any one time. It means that all those people in those pools are competing with single users like you & me and that's not even counting their actual team. There acting just like a bitcoin pool where many miners pool there PC's(or miners) together to increase the speed of uncovering the new blocks and receiving a share of the loot quicker than normal. They use the weak authenticator so they can all crunch under the one username to in effect form one super user. Although this is not a completely new idea the way they are going about it is. I most certainly understand the need to offset crunching costs if at all possible but turning a working system inside out is just annoying the old guard & new alike. It's kinda like what BU did with credits, I wonder how much of this the average user will put up with before bailing? The boinc Hierarchy needs to step in and guide the way and lay down some rules for projects & users alike to follow or at least gives users more say in whats happening, but I can't see that happening any time soon. I guess i'm getting off topic but one things for sure even if we made every AA from now on POGS it still wouldn't be enough to keep gridcoin away from our hard won top spot. Just my 2cents for whatever's it's worth. Suffice it to say for now, I am losing faith that most DC projects are doing any good. I didn't mean that post to sound as if the whole system is broken. Maybe it would have been better posted in the "what annoyed me today" section. Boinc is a complex system and it's certainly not without it's problems, but overall I still fully believe in the DC principal. I mean why would I keep crunching if I didn't? There's so much greed & hatred in the world and boinc goes against all that by helping anyone, anywhere that is trying to make a difference and can be helped computationally for free and that's an awesome thing. Besides mostly I still find Boinc an interesting & enjoyable hobby too. Just pointing out some problems as I see them, I really didn't mean for it to sound so dire. Each of those Xeon E5-2683 v4's is capable of 190K/day .... on their own. There was a dozen of those dual xeon v4's on there - that elephant has since left the group. It is what it is. I think it is broken. The med. projects especially protein folding have been a total bust some running for over a decade without even "promising" compounds being taken on to wet labs; silly projects like monkeys; useless math projects; Russians with projects I do not trust and cannot prove they do what they say they do. I can count the ones I think are worthwhile on one hand now. I am much more critical now on just what I am spending a lot of time and money supporting. I could go on and on but we are off to Napa this morning to visit friends, drink some wine and probably eat too much. Cheers! Anyone want to build a dream rig? One of these puppies would be a little bit wicked. Upgrade it with e5-2597 v4's and 1080Ti's. What are the chances of something like that happening in the next 3months though? Should we attempt to, idk, somewhat delay it and call for everyone to focus a larger majority of their crunching on POGS? Or is it simply not worth it? Or is it time for us to just drop down a position? Gridcoin are pumping out 2.9Mil credit/day zsalter. We couldn't come NEAR matching that. Guys should we ditch other projects for the time being and crunch POGS for a last hurrah?? I'm tempted. Popped over to POGS, word has it there has been no work for the last 3 days. Anyone else who can confirm?? ?